There is a place where elephants, lured by the season, concentrate in large herds creating dust and scenes from a time of our dreams. Game movements are cyclical, running to the rhythm of nature's moods. 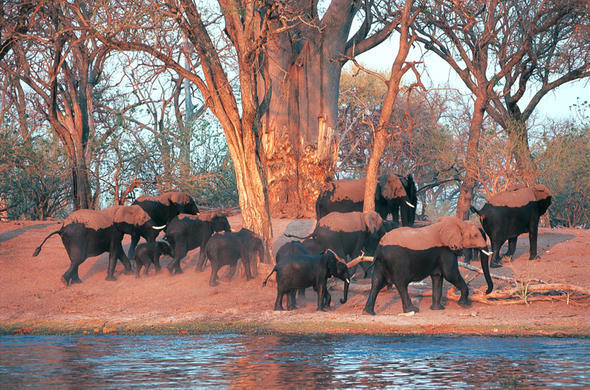 In Chobe however, the dust is created by man's insecurity, an inability to be part of the whole. A war, pointless in its reasons, stopped the elephant using the traditional migration routes, forcing them to concentrate on the narrow strip of the Chobe and Linyanti rivers.What it now provides is an experience from the past, where the dust is an echo of the ancient song barely audible above the clamour of man's advancement.The elephant season's of Chobe are very distinct. There is the rainy season when they wander far from the permanent source as there is plenty of food and water in the hinterland. With the first hint of rain the herds disperse, leaving the riverfront almost empty. It is a time when the echoes of the dust are heard in the scent of renewal.